Chief Minister Prem Kumar Dhumal announced Elementary Meritorious Scholarship Scheme for elementary students of Government Schools in the State. He announced it in a Pratibha Samman Samaroh organised by the Hindi Daily Amar Ujala, at Peterhoff. Chief Minister said that State Government was providing Meritorious Scholarships under Medhavi Chhatarvriti Yojna, Ambedkar Chhatravriti Yojna, Thakur Sen Negi Chhatravriti Yojna to meritorious students of vulnerable sections of the society. He said that with a view to inculcate spirit of competitiveness amongst elementary students, the State Government had decided to bring them under the fold of scholarships. 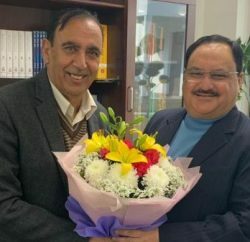 He said that District Institute of Education and Training would be designated agency to conduct scholarship eligibility test at District-level and training institutes for students passing fifth standard examination with B-Grade and above ranking. Prof. Dhumal said that separate seniority list of the students ranking at first and second positions would be prepared at Block-level. He said that top ranking two girl and two boys at 6th, 7th and 8th standard would be selected in each education block. He said that a total of 12 such scholarships would be given in each of the 124 education blocks in the State thereby selecting a total of 1,488 successful meritorious students. He said that qualified eligible would get an annual scholarship of Rs. 800 and for continuation of the scholarship in next higher class, they would be required to pass examination of respective class with a minimum of B-Grade. He said that State Government would spend Rs. 12 lakh per annum over the new scheme. 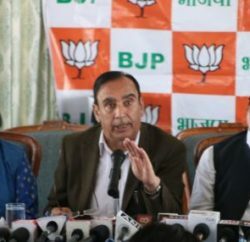 Chief Minister said that Himachal Pradesh had emerged the leader in Education Sector in the country as 19 percent of annual budgetary provisions had been earmarked for the sector compared to only 4.85 percent at the national level. He said that distribution process of free school uniform to 9,27,205 students was in progress and was targeted to be completed by the end of July, 2012. He said that it was heartening to note that students studying in Government schools were now finding their name amongst the top 10 students in different examinations. He said that girls were being provided free education which had motivated them to study further in higher classes. He said that it was noteworthy that amongst the awardee students, number of girl students was quite impressive and encouraging. Prof. Dhumal honoured the students for achieving top ten positions in plus two Science, Commerce, Arts, Vocational streams and in Matric examination besides students of different educational institutions located in Shimla, with citation and memento. Ishwar Dass Dhiman, Education Minister, said that such felicitation functions had been instrumental in motivating the students to study more vigorously and obtain maximum marks in their examinations. He said that State Government had accorded top priority to Education Sector and launched a number of schemes for the welfare of students. 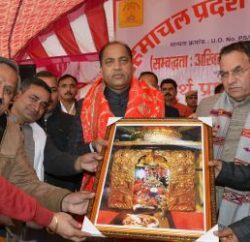 Sunil Mutreja, Executive Director, proposed vote of thanks and said that the Group was indebted towards the readers of Himachal Pradesh who had always been supportive to the news coverage by the Hindi Daily Amar Ujala. Uday Kumar Sinha, Executive Editor, welcomed the Chief Minister and said that the motive behind organizing ‘Pratibha Samman Samaroh’ had been to recognize the efforts put in by them in obtaining top ten positions in different streams of examinations. He said that awards given to such students would inspire many more to work more hard to find their name in the list of awardees during coming years. Narinder Bragta, Horticulture Minister, Jai Ram Thakur, Rural Development and Panchayati Raj Minister, Suresh Bhardwaj, MLA, Ganesh Datt, Vice-Chairman, HIMUDA, Balram Sharma, Chairman, HP Board of School Education, Sanjay Chauhan, Mayor and Tikender Panwar, Deputy Mayor, Municipal Corporation, Shimla, P.C. Dhiman, Principal Secretary, Education, I.D.Bhandari, Director General of Police, B.D.Sharma, Director of Information and Public Relations,. Dinkar Burathoki, Director of Education, Dr. S.S.Kaushal, Principal, IGMC, H.S.Chugh, Vice President, Mohit Sharma, Vice President, Rajender Singh, Resident Editor, Amar Ujala, other dignitaries of the town and senior officers of the State Government were also present on the occasion.